I got totally crafty today and made these. 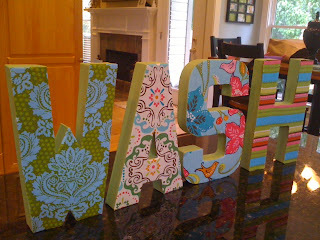 The are 3D letters that I painted and then applied fabric to the front. I saw this on my new favorite website the other day and said "hey, I can do that! "...so I did. I am thinking of making them to sell at the Mt. Laurel Festival in October along with my scarves. I think if I could come up with a couple more things to make and sell it would be good. 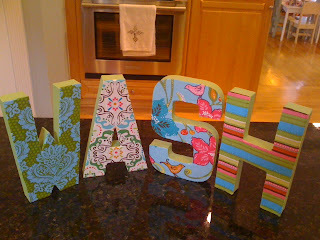 I love these fabrics so much but especially the W and the S...so stinkin' cute! I am so in love with this bed. 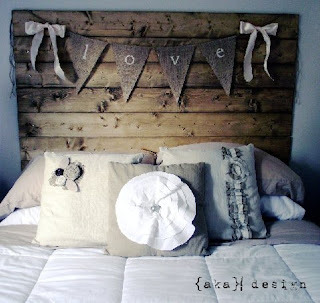 The headboard is made from reclaimed wood and I am asking ever-so-nicely if my sweet, talented, handy-dandy hubby would PLEASE, PLEASE, PLEASE build me one. We are trying to sell our daybed upstairs and I would love to replace it with this. I have a vision for that room! I want everything in a neutral color with some super sassy pillows....come on hubby!!! Pretty please. Is this cute or what? 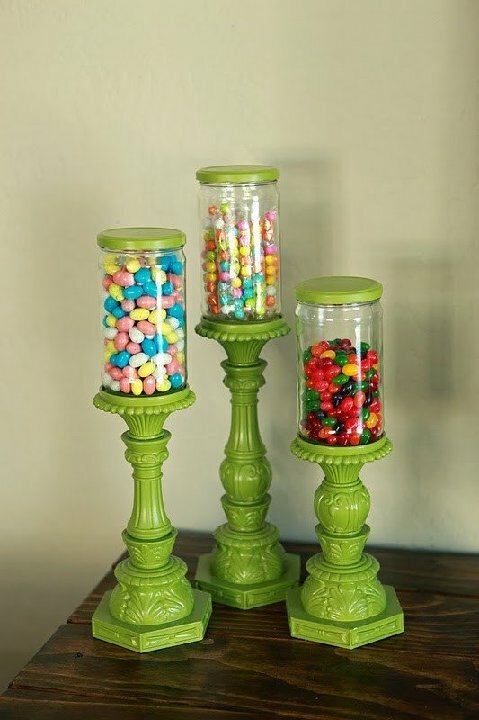 Just some candlesticks that have been painted and some jars filled with colorful candy. Love it! I am so making some of these. 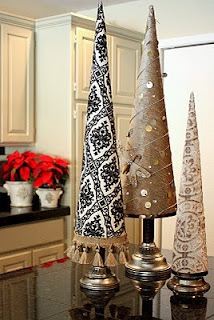 I read the tutorial and the bases are candlesicks, the trees are posterboard with fabric and trim. So cute! 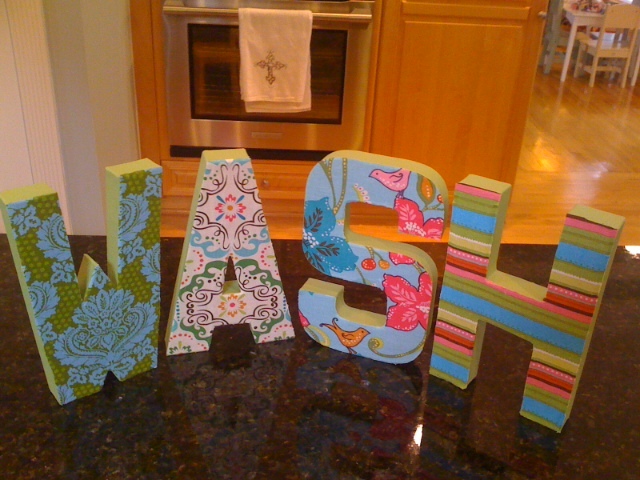 My cute new letters hung above the laundry room door. They make me happy! I found a new website that I just cannot get enough of! 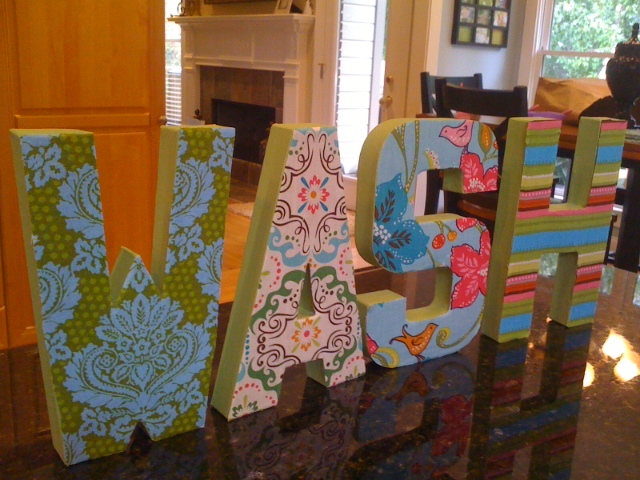 It's all kind of cool DIY craft projects and some that even "I" can do. Here are a few things I found on there today that I am thinking of trying out. We had a playdate at our house on Thursday and it was lots of fun! Holly came over with Anna and Andrew, and Kelley came over with Samantha and Abby. The moms got to talk for a while and the kids got to play. All of the girls immediately dressed up and Abby did their hair and make up. Andrew hung out with the moms, played with the girls some and played the Mobigo...he just rolls with the punches! Emerson was supposed to come too but couldn't make it this time. Her baby sister just had surgery so Julie and Tucker were at the hospital with Baby Ellis and Emerson was with her grandmother who had something come up and was unable to bring her. Hope you make it next time Eme!! This is our beloved Dr. Darby (Darby McElderry is her name but everyone calls her Dr. Darby). The girls love her so much and I do too. It is so nice to have a great doctor for your kids that you can relate to and that actually LISTENS to what you say. The girls had their 4 year old check up last week and they did great. Unfortunately they each had to get 4 shots this visit so I took Nana for back up. They are at an age now where they dread shots and I didn't think I could handle keeping them occupied, dealing with shots and actually remembering the things I wanted to talk to Dr. Darby about without help. Shout out to Nana!! Everyone has been asking if Sutton is taller than Taylor and the answer is...yes, by 1/2 an inch. But DO NOT tell Sutton that because she just gloats when telling Taylor "I'm taller than you"...makes me so mad. I always tell them that they are the same size so I don't have to listen to the arguing. I mean, really, does it matter? They are both in the 75% for height (which means that 75% of the kids their age are the same height as they are) and Sutton is in the 10% for weight and Taylor is in the 5-10% for weight. So, average height and skinny minnies. I try to make them eat as much as possible but Taylor eats like a bird usually. Sutton eats like a little truck driver so I don't know why she doesn't weigh more. They had a great check up and the shots went fairly well also. They only cried while she put the shots in and then stopped as soon as they sat up so it wasn't bad. Dr. Darby gives popsicles to all 4 and 5 year olds (I guess because the shots are so brutal) and they both got to pick out 4 stickers each (one for each shot) so they were happy as could be when we left there. The girls got these precious umbrellas for their birthday from Macy and Vivi. Aren't they cute? They played with them inside for a couple of days and then it rained cats and dogs a few days later and they begged me to let them play in the rain...so I did. They had a blast just walked up and down the sidewalk and through the yard over and over and over. It's the simple things! I love this picture of the girls! This is their ballet picture. I have tons of these to give to everyone but forgot with all of the craziness of the birthday party so I will mail them out to all of you soon. The girls got their first pedicure for their birthday and they loved it! I thought Taylor might not go for it since she hates anyone messing with her feet, but she surprised me. They are already asking to go back again.